The Byres is set in the heart of the picturesque Cotswold village of Elmley Castle, an Area of Outstanding Natural Beauty. A recently renovated barn conversion, just three miles from Pershore, The Byres offers beautiful views, chance to spot deer and other wildlife, and is surrounded by superb walking countryside. The Byres' original features have not been touched since its agricultural days &ndash; and the owners have turned it into a cohesive dwelling fit for up to four adults and a travel cot. With exceptional attention to detail, open-plan living, charming kitchen and dining, beautiful bedrooms spacious living room and private outside space make The Byres a must-visit. 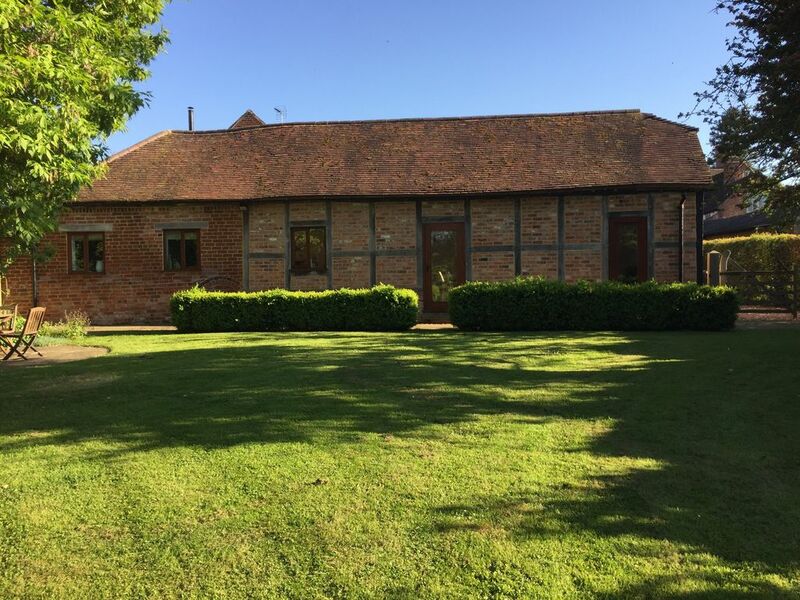 The converted barn is a peaceful and perfect haven for relaxation, and an ideal holiday location for exploring the unspoilt beauty of Worcestershire and the Cotswolds. The pretty village of Elmley Castle has a pub within walking distance and nearby riverside market towns of Pershore and Evesham are both a short drive away, providing a selection of mainstream and independent retailers, a theatre and local festivals. Double bedroom with en-suite bathroom. The bedroom's design includes traditional oak rustic doors, chandelier light, oak beams, large wardrobe and an overall attractive country-cream d&eacute;cor. White Company bed linen to aide a restful night's sleep. An en-suite bathroom room offers guests a good amount of privacy with a bath and shower attachment. Twin bedroom with separate walk-in shower room. A cosy bedroom with a chest of drawers, pretty animal pictures and a rustic oak door. White Company bed linen to aide a restful night's sleep. The Byres is a perfect haven for relaxing and an ideal holiday location for exploring the unspoilt beauty of Worcestershire and the Cotswolds. Situated in the pretty village of Elmley Castle, an Area of Outstanding Natural Beauty. The nearby riverside market towns of Pershore and Evesham are both a short drive away, providing a selection of mainstream and independent retailers, a theatre and local festivals. Elmley Castle is a pretty village at the foot of Bredon Hill; with a large number of half-timbered cottages and St. Mary's Church that boasts medieval sculpture. On the slopes of Bredon Hill are the remains of the Norman castle which gave the village its name. Two well-proportioned bedrooms house up to four guests comfortably plus a travel cot, all on one floor. Bedroom 1 Double bedroom with en-suite bathroom. The bedroom's design includes traditional oak rustic doors, chandelier light, oak beams, large wardrobe and an overall attractive country-cream décor. White Company bed linen to aide a restful night's sleep. An en-suite bathroom room offers guests a good amount of privacy with a bath and shower attachment. Bedroom 2 Twin bedroom with separate walk-in shower room. A cosy bedroom with a chest of drawers, pretty animal pictures and a rustic oak door. White Company bed linen to aide a restful night's sleep. The Byres is set in the heart of the picturesque Cotswold village of Elmley Castle, an Area of Outstanding Natural Beauty. A recently renovated barn conversion, just three miles from Pershore, The Byres offers beautiful views, chance to spot deer and other wildlife, and is surrounded by superb walking countryside. A great location for exploring the Cotswold District or visiting Cheltenham Races. The Byres is well appointed and beautifully decorated. It is located in a quiet, quaint and friendly historic village, away from the hustle and bustle of the commercialised Cotswolds tourist towns. We truly appreciated this haven, it was the perfect base for my husband and I and our two adult children. Many thanks! Located in the heart of the Cotswolds, Sudeley Castle & Gardens has played an important role in England's history for over 1,000 years. Rated amongst the top attractions on TripAdvisor for &lsquo;Things to Do in the Cotswolds', the castle rooms and exhibits contain many fascinating treasures, from ancient Roman times to the present day. The location for the Tower was wisely chosen, a dramatic outlook on a pre-medieval trading route and beacon hill. Wyatt designed his "Saxon Tower" as an eccentric amalgamation of architectural components ranging from turrets, battlements and gargoyles to balconies. Owned by the National Trust, this has a superb view from which the Black Mountains in Wales can be seen on a clear day. This is the site of the Cotswold Olympics founded by Sir Robert Dover in the 17th Century to keep the locals amused but was banned in the 19th Century. It now takes place in the first week in June with a torchlight procession down into Chipping Campden following the games. The next day is 'Scuttlebrook Wake'. This is a carnival in Chipping Campden. The finest gardens in the country are to be found just four miles outside Chipping Campden. Hidcote is owned by the National Trust. Situated next to Hidcote Manor and one of its main rivals. Situated in the Cotswold Hills overlooking Broadway and the Vale of Evesham. Started growing Lavender in 2000, and now has 35 different varieties stretching over 53 acres. Gift shop and tearoom serving lavender scones. Bredon Hill, wonderful for walking and cycling. Pershore Abbey and Abbey Park, tours are available by contacting the church office. Croome Park owned by the National Trust, dating back to the 18th century was once the home of the Earl of Coventry. Slightly further afield is Stratford upon Avon, world famous for its Shakespearean connections. Visit the Royal Shakespeare Company theatre or go boating on the River Avon. Stroll around the Butterfly Farm whatever the weather or opt for a theatrical tour of Stratford with Grimm's Ghostly Tours. Elmley Castle has many amenities including a church, an historic pub and village hall. Its established cricket team still plays on the attractive cricket ground - worth a slow clap or two. The market towns of Pershore and Evesham have comprehensive amenities for most everyday needs, whilst Cheltenham has more extensive shopping and leisure. You can pre-order your groceries to the barn to take out the hassle of shopping. Ocado, Waitrose, Sainsbury's, Tesco and ASDA all deliver. The Queen Elizabeth I public house or "Queens" as it is affectionately known locally, is an old pub dating from 1575 which was supposedly visited by Queen Elizabeth I. The pub is set on the village square and has a cosy atmosphere with wood fires and warming winter food. Families and dogs are very welcome. Broadway Deli is a lovely venue for coffee and lunch or why not try the local ice cream at Churchfields Farmhouse in Droitwich. Pershore boasts an impressive variety of great pubs, caf&eacute;s and restaurants to suit whatever you fancy. For a relaxed bite to eat try The Pickled Plum - an honest pub with great grub, or if it's an historic pub and live music you are after, head to the 15th century Star Inn with a beer garden running down to the river. Pershore's finest is Belle House which has become a renowned &lsquo;foodie' destination over the last 12 years. A former Fire Station, Belle House is now a fine dining 80-seater restaurant with private dining and a Traiteur - Deli selling a large variety of delicious products home-made in the Belle House kitchen for you to enjoy at home - Kitchen to Table. Bredon Hill is an outlier of the Cotswolds, isolated although sharing the same underlying geology. The walk rises steeply from the village of Elmley Castle and makes a circuit of the plateau before a steady descent from the folly which crowns the highest point. Walk length: 9.9 kilometres (6.2 miles), Duration: approximately 3 hours, Height gain: 250 metres, Difficulty level: Moderate. From the pub, enter the churchyard which you will see 50 metres in front of you to the left. Go up the main drive but turn left across the grass, just before an unusual sundial. It is worth having a good look at this, as well as going into the church. You leave the churchyard and pass a small lake, before coming to a stile leading into a field. The right of way actually goes across the middle of this field, but you can follow white markers around the edge to the right, which is probably easier. In the far corner is a plank bridge and a stile. From here go left to the corner where there is another stile. On the other side of this stile is a track. Turn right on it and keep going until you come to this second bridge. Beyond it one track goes left along the edge of the wood and another goes right, uphill. Naturally our route goes uphill. You will come to another similar bridge. You should cross this bridge to the white marker and go uphill to another white marker (in fact there may be easier ground on the near side of the stream). The field narrows to the width of a gate, beyond which the path continues. A little higher up you come to the junction of two bridleways. You don't want the one to the left - keep going uphill. You reach a gate at the edge of a wood. Just follow the path through and up. On your right there will be some high deer-fencing for a time and clear signposting at the occasional junction. You reach a gate at the end of the wood, with a track leading into the open. Follow the track to its junction with another track and go straight over through a gate. After two fields a wider track goes to the right. Follow this track towards the wood with pine trees and an arable field on the right, until you come to the access road to a radio mast which you will see to your right. Carry on over the crossroads in the same direction. You reach yet another crossroads. Once again continue in the same direction. You come to a T-junction where the appearance is of your track curving left. The branch to the right is not obvious but you don't want it anyway. Just go left on the gravel track until another track goes off to the right. This time turn right. This track leads to a barn, all that remains of Sundial Farm apart from some ruins. Follow the track past the barn but when you are in sight of the entrance on the far side, look for a stile on the right. Cross it. A path along the field edge leads to a stile in front of a strip of woodland. Go over this and turn right - you have a choice of parallel paths. Both lead to a gate onto open ground. The path is clearly visible and leads to a second field, where you can see the tower of Parson's Folly. Before you reach the tower, you will pass through the ramparts of an enormous Iron Age hill-fort. The tower, incidentally, was built to raise the height of the hill to 1000 feet (310m). Continue past the tower and look in a hollow near it for an erratic boulder called the Banbury Stone. Follow the stone wall on the left, ignoring the gate that you see and passing again through the ramparts. You will find a gate in a corner by a small copse. Go through this and when you reach a fence on your right, follow it to a gate by a wood. Turn left and go downhill following the edge of the wood (in other words don't go through this gate). The direct path is obscure, so this is an easier route to follow. The little path joins one from the left in an area of bushes. The path is clear enough as it goes through these bushes and out into the open. Now follow roughly the fence line on your right, going downhill all the time until you reach the junction of a number of tracks. Turn right, taking the track along the fence by the large tree, not the bigger double track. This leads to an enclosed track beneath trees, which in turn becomes a surfaced lane by a half-timbered house. This lane leads down to the village, and back to The Queen Elizabeth. A fantastic walk in a truly glorious area of Worcestershire. The first part of the walk is through quiet pastures with far and distant views over superb landscape that takes in the dark outlines of the Malverns. The efforts of ascending Bredon Hill are more than compensated by the fabulous views and the sheer ecstasy of being in such marvellous surrounds. Walk length: 10.4 kilometres (6.5 miles), Duration: approximately 4 hours, Height gain: 255 metres, Difficulty level: Easy. Walk across the square and up the road to the left alongside the Queen Elizabeth pub, passing beautiful old black and white houses. Turn right on narrow secluded path beside farm and take a stile to turn left by farm buildings to walk beside hedge where there is pronounced ridge and furrow meadowland. Walk on in pastures on a gradual incline, woodland at the top of a slope. 9. Turn right over a stile and head over to another, then turn left beside hedge, taking a stile to continue above meadow, a large and grand hall over to the right. Take another stile and footbridge to go on, the tower of Great Comberton now in view. Two more footbridges and a stile cross two streams close together before the route continues beside fencing and hedges. Climb stile to turn right on bridleway for few yards. 10. Turn left off it and walk above field, following it round to a gap. Turn left beside hedge to find a stile on left to continue on the edge of four more fields, zig-zagging to walk on other side of hedge, looking towards Bredon Hill. Maintain direction, eventually reaching a stile out onto narrow road in Great Comberton. 11. Turn right towards church and walk along into Church Street. From Church Street in the village centre, walk into Russell Street and pass Tibbetts Farm with its splendid long timbered barn. Walk on along the bridleway, quiet and secluded, with glimpses of Bredon hill through gaps in the hedges and trees, then opening out to give clear views. Continue through gap to walk with hedge on right, the tower of Little Comberton Church over on the left. Leave hedge in next field to maintain direction on a gradual ascent, then go downhill and pass a footbridge before walking on enclosed track again. Turn right on another bridleway on a steady incline, entering woodland of Cames Coombe. The ascent steepens on the way up the slopes of Bredon Hill, the forestation getting thicker; a silent, eerie environment but for the occasional cry of a wood pigeon or the sudden song of a bird. Come out into a clearing,	Far Wood and Comberton Wood on the right and continue in the same direction to a gate. Go on uphill to walk beside Doctor's Wood, then away from it on uneven ground, to a gate. Walk on, now above wonderful landscape, and follow well defined track to another gate. Go on through it into Long Plantation amongst a green and lovely mantle of trees of varying hues. Take gate out onto a left path above wood, walking on the level for a while, a radio mast can be seen on the right. From a gate on the right, bear left into The Plantation to take a gate on a descent, the vegetation thick and dense. Follow the well-trodden track, part of the Wychavon Way. Through a gate go on, downhill still, on a grass track, Castle Hill over to the left. Continue downhill towards Fiddlers Knapp, circling round to the right to cross a footbridge. Go on downhill and take the left of a fork to find a footbridge. Take the left path and pass an expanse of water. Take gate to turn left, off the Wychavon Way then over a footbridge and stile to turn right in a meadow, heading for a stile in view at far end. Large and majestic trees are dotted all around. Turn left beside hedge on the edge of a field and follow it round. Take a stile on left and walk over a small meadow to another. Climb stile onto woodland path to the sound of a waterfall flowing from a large pond and walk on into the churchyard of St Mary the Virgin Church at Elmley Castle, and along to gateway out into the village square, where The Queen Elizabeth can be found on the left.